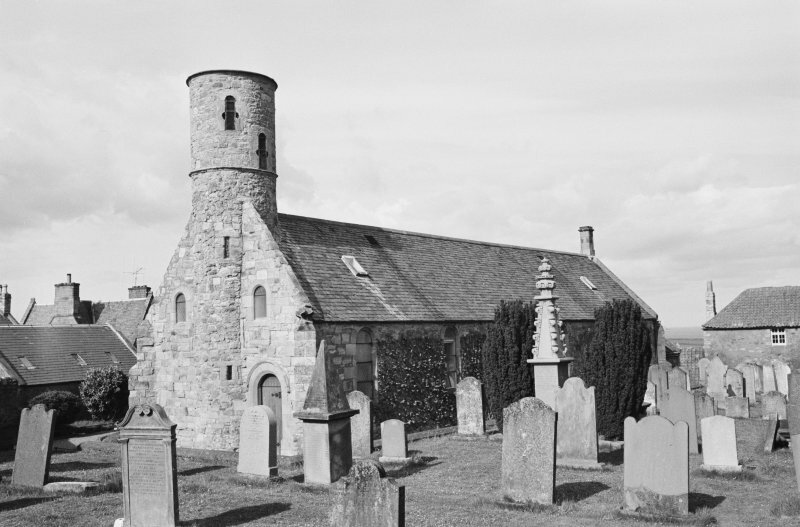 View of Cockburnspath Parish Church. View of Cockburnspath Parish Church from NE. 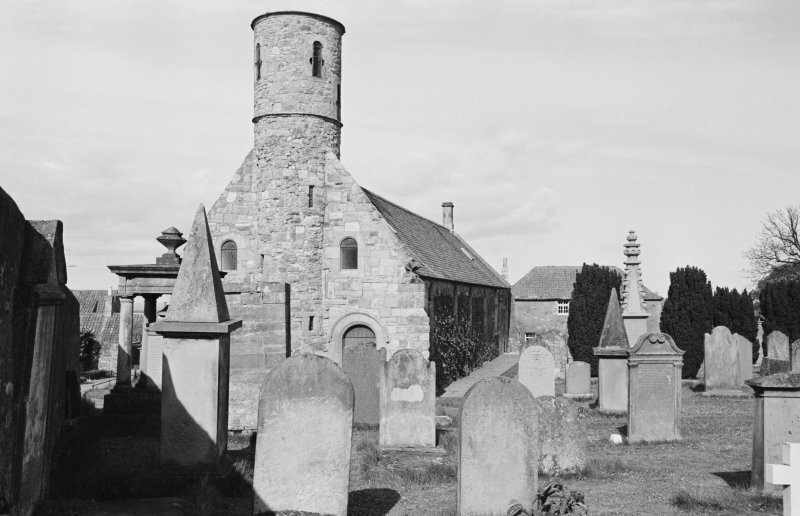 General view of church and churchyard, Cockburnspath . 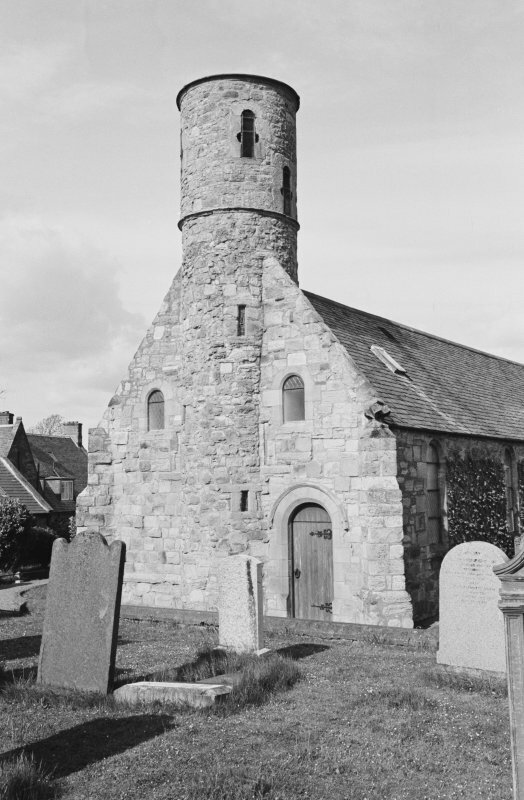 View of north tower, Cockburnspath Parish Church. 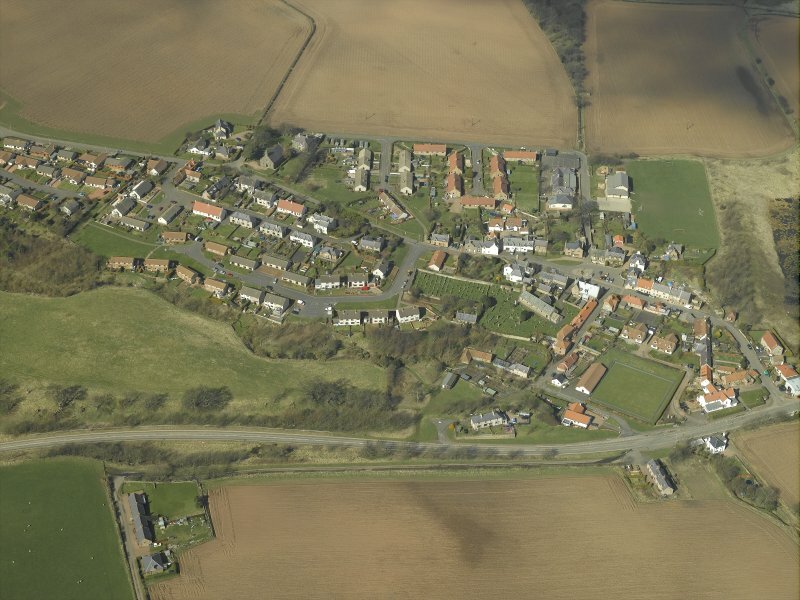 General oblique aerial view of the village, centred on the church, burial-ground and churchyard with the hotel and stable adjacent, taken from the SE. 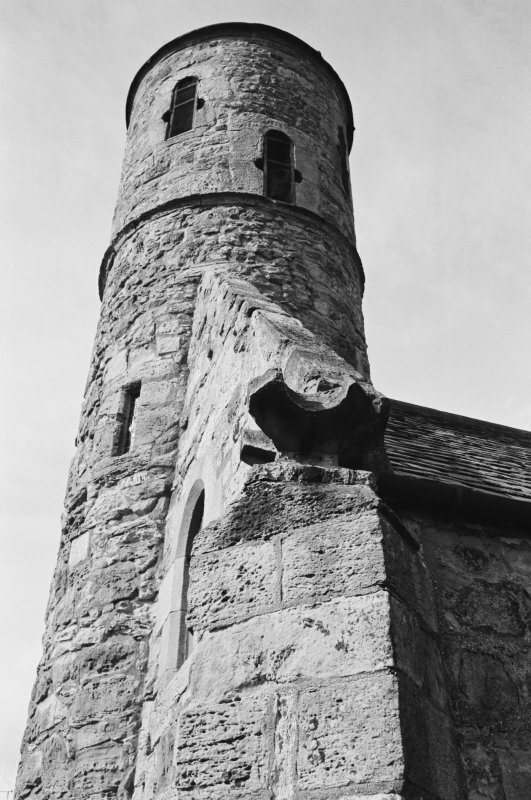 Detail of Cockburnspath Parish Church tower. 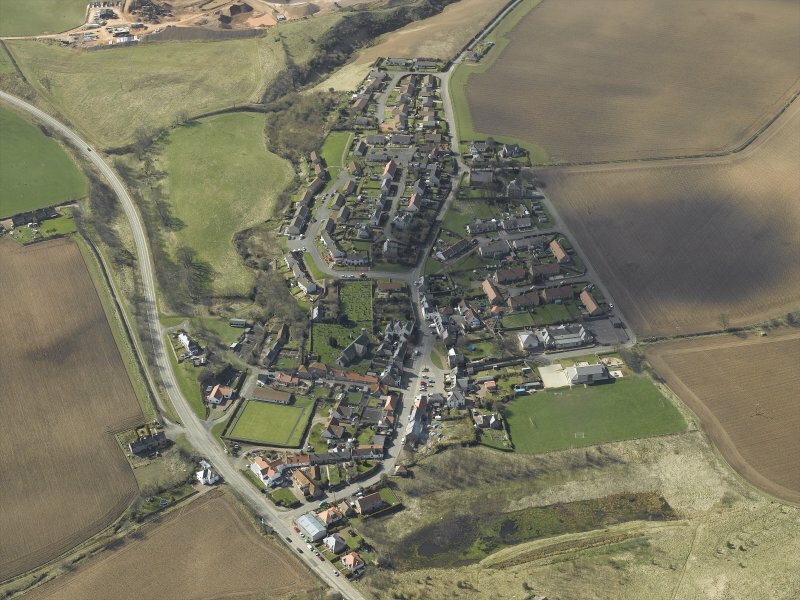 View of Cockburnspath Parish Church and churchyard from SW.
General oblique aerial view of the village, centred on the church, burial-ground and churchyard with the hotel and stable adjacent, taken from the NE. View of Cockburnspath Parish Church from SE. View of Cockburnspath Parish Church from S.
View of Cockburnspath Parish Church from SW.
(NT 7745 7105) Cockburnspath parish church is a simple oblong on plan, measuring some 80ft by 18ft 3 ins over walls averaging 3ft in thickness, and having a diagonal buttress at each angle. 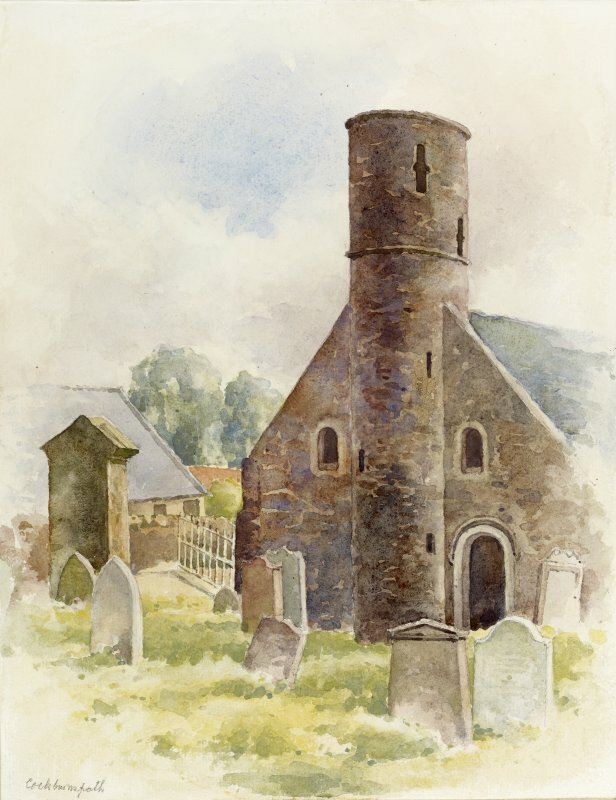 The details indicate that a church existed on the present site in the 14th and 15th centuries; this probably succeeded a still earlier building. 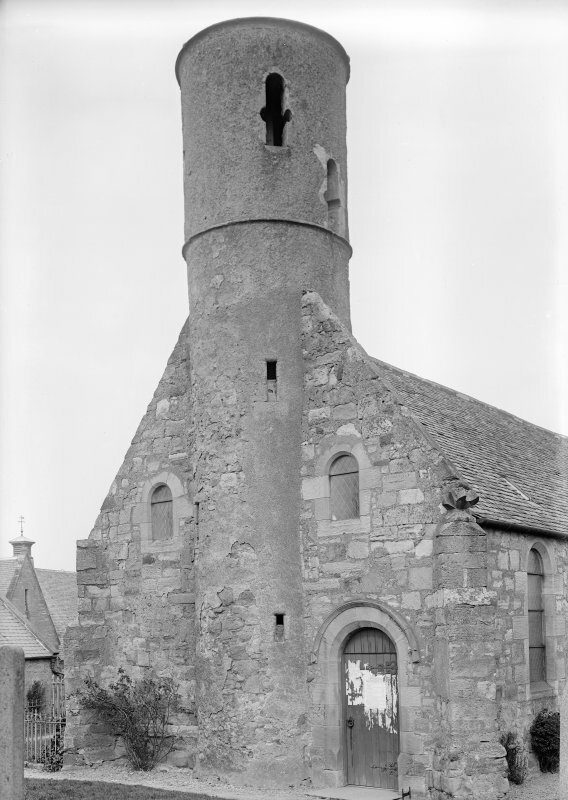 A round tower, some 9ft internal diameter, is situated in the centre of the 14th century W gable; it was added in the late 16th or early 17th century. 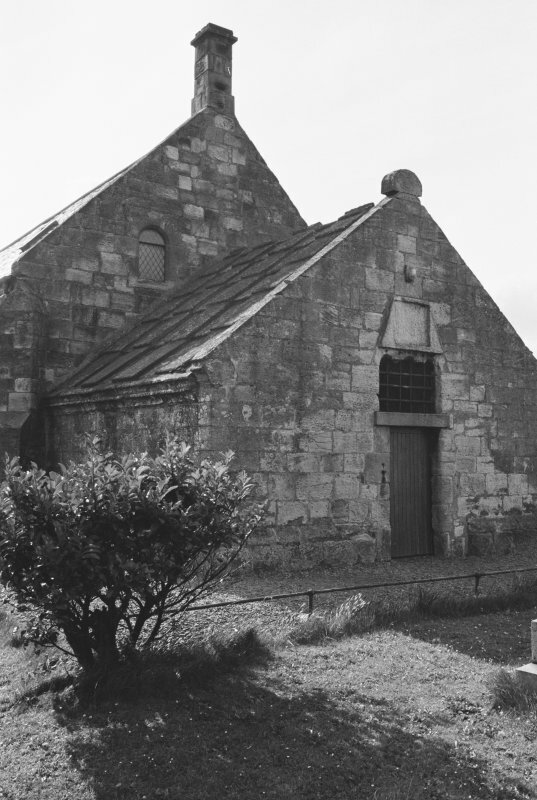 A small tomb-house, roofed with a pointed barrel vault, abuts against the E wall of the church, and is now used as a heating chamber. 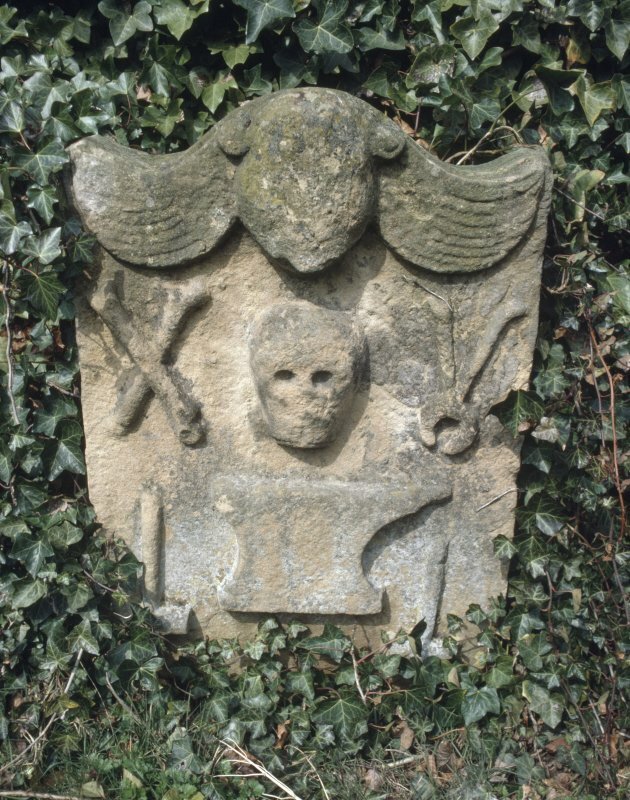 It is dated 1614. 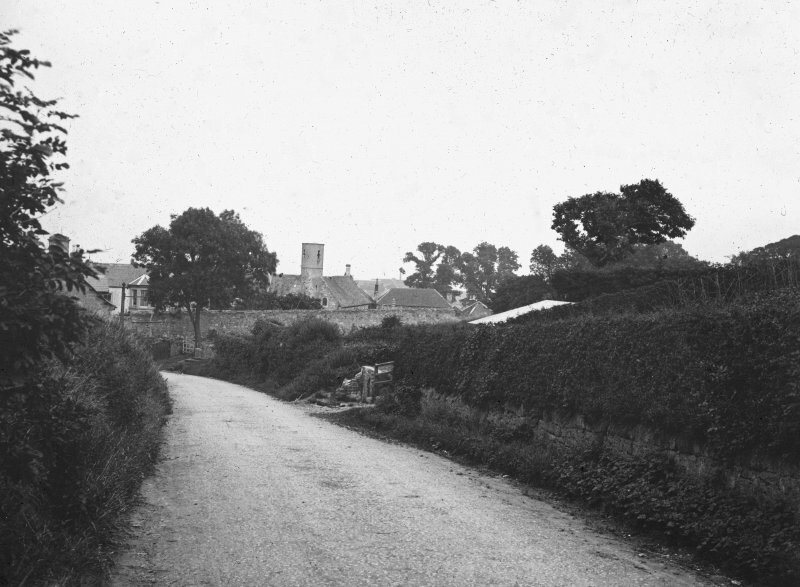 Before the Reformation, Cockburnspath was a chapelry of Oldhamstocks. 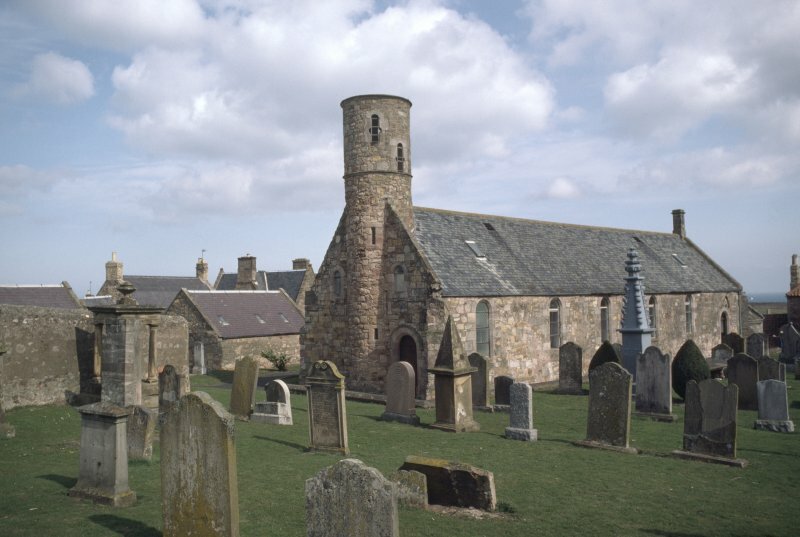 The chaplain of 'Colbrundspath' is mentioned in 1255, but whether his chapel occupied the present site is not known. As described and illustrated by the previous authorities. The church is still in use for public worship. Visited by OS (WDJ), 5 April 1966. 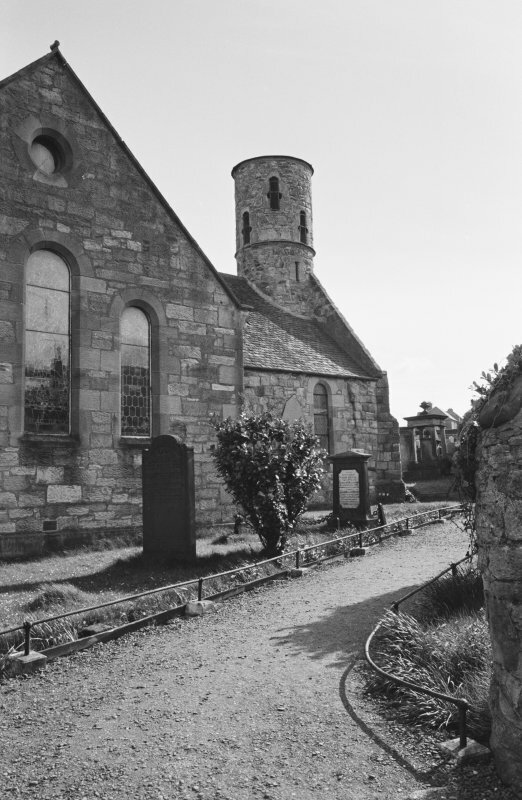 The church was extensively restored in the 19th century and its original date of construction is uncertain; the building is unlikely to be later in date than the 16th century. 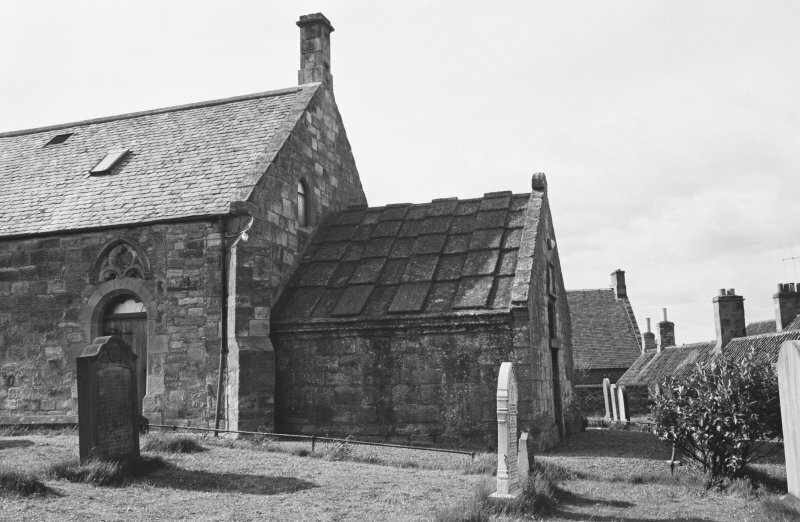 Photographic survey of the exterior of Cockburnspath Parish Church, Berwickshire, by the Scottish National Buildings Record in 1962. Visibility: This is an upstanding building. Information from Scottish Borders Council.